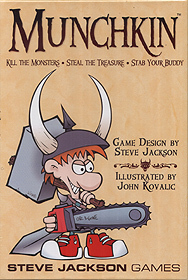 Munchkin is a game which is firmly a tongue-in-cheek parody of dungeon crawl games. Players have to kill monsters they meet to gain levels, the object being to be the first to gain 10 levels, while at the same time trying to prevent your opponents from doing the same. It's lots of fun and can actually be played with 2 just as easily as playing with 3 or more. The base game now has several expansion decks to add variety to the game, as well as spin-offs for other genres such as spies, Cthulu, Western and sci-fi. There are even rules to combine everything into one massive game! Munchkin, first of all, is a humorous game, and as such, despite its name, should not ever be played with a real munchkin who can’t loose. There, you’ve been warned. Now, what is Munchkin? A card game for role-players, about hack, slash, loot and all that other good stuff. The objective of the game? To be the biggest munchkin around, first to advance their character to level 10. The means? Well, I have mentioned hack, slash and loot, haven’t I? The rules are simple, four pages with a in case of doubt, the owner is always right clause. The set-up is equally simple: divide the cards into dungeon cards and treasure cards, have every player draw 2 of each (and use them immediately if they want), and roll initiative. No, wait, that’s roll to see who goes first. On their turn, players draw a card from the dungeon pile. They might draw a curse, which is tough luck (or, possibly, duck). They might draw a race (being elf, dwarf or halfling is cooler than being plain, ordinary human, after all) or a class (being fighter, wizard, priest or thief is waaay cooler than, well, just being), which give interesting new abilities. They might draw some kind of weird special card, which is to keep for later use. Or they might draw a monster, which is, well, good if they can beat it up (add your level and any bonuses and compare to the monster’s level, it’s that simple… maybe), and just as well (to the other munchkins, anyway…) if they can’t. Of course, if one player is fighting a monster, they might convince others to help them (if they’re not tough enough)… or other might choose to interfere with special cards or potions. Obviously, merely playing this game can’t be what is fun about it – it’s a bit simple for that. It’s the parody that matters, so while anyone should have a good laugh with this game, fantasy role-players will get the most out of this game. After all, while anyone will be able to see the pun in why the Gentleman’s Club only gives a bonus to male characters (which, by default, means players… unless they were on the receiving end of a particularly nasty curse), the 3,872 Orcs aren’t quite as funny if they don’t remind you of some high-powered high-level campaign or other? And of course, Promise the GM to Stop Telling Him About Your Character: Go Up A Level cannot possibly be as meaningful to those who do not play RPGs. All in all, Munchkin is a great game if you’re looking for a laugh. In the right crowd (like, say, your role-playing group), chances are you’ll waste the night away (instead of killing the evil overlord, mayhaps). Definitely recommended.